Symptoms of a stroke -- or cerebrovascular accident -- in rabbits can resemble less serious afflictions, but it's better to be safe than sorry when your pet's health is at stake. If your bunny exhibits any sort of odd neurological behavior, get him to the vet immediately. Prompt diagnosis and treatment can make all the difference. Unfortunately, death is sometimes the sole symptom of a stroke in rabbits. It's scary to see your rabbit's head tilting, and the condition can result from stroke. Formally known as torticollis, head tilt isn't necessarily a death sentence. While middle-ear infection is a more common cause, even rabbits suffering head tilt from stroke can recover -- to some degree -- over time. 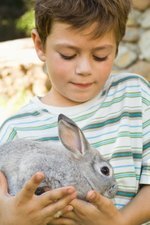 Blood tests and X-rays may reveal other causes, but the only definitive ways to diagnose stroke in a rabbit -- while he is still alive -- is via magnetic resonance imaging or computerized axial tomography. These diagnostic tools are better known as MRIs or CAT scans, respectively, but not every "exotic" veterinarian's office will have them. Your vet may give your pet a corticosteroid injection initially to reduce pain and inflammation, along with blood thinners if she suspects a clot, but supportive care is the only real treatment. That might include expressing your rabbit's bladder manually several times daily and hand-feeding him. He may require intravenous fluid therapy, which your vet can show you how to do at home. Your vet will give you her candid opinion of your rabbit's prognosis, and you can make decisions accordingly.